This friendly, family run site lies in a quiet picturesque location at the foot of Glen Duror. The park is well sheltered and is a real sun trap in the summer months. 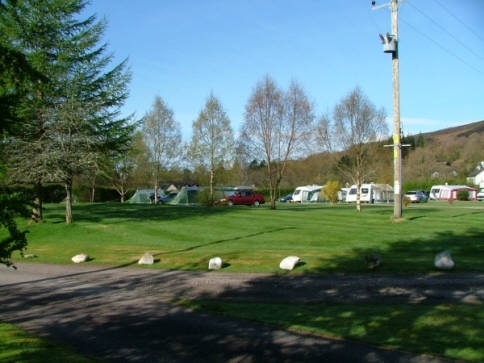 Our site has generous hard standing and grassed pitches that are well drained. We welcome Motor homes, Caravans, Trailer tents and tents. Dogs are also welcome. 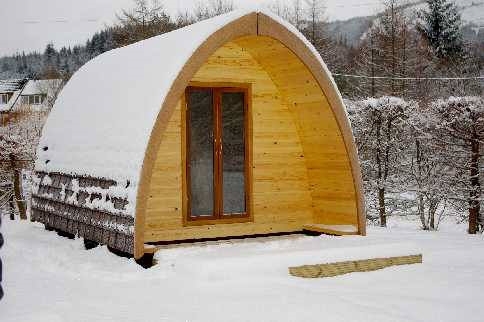 New for 2011 - Camping Pods. These are essentially wooden tents and are designed for 'Camping for the 21st century'. All you need to do is bring your sleeping bags, food, tea and coffee etc. Blow up mattresses, chairs, plates, cutlery, mugs, stove, cooking utensils and a table are provided. There is also light and heaters in the Pods and they are well insulated. And finally, no wet tents to take down at the end of the trip! What more could you ask? The shower block incorporates Waterless urinals, automatic lighting, self closing taps, central heating and insect mesh screens in the double glazed window units. There are shaver points in the gents and hair dryers in the ladies. The 'campers' kitchen includes sinks for food prep and dishes, a sink for hand washing clothes, washing machine and tumble dryer, fridge freezer, toaster, kettle, microwave and a small reading library where you can exchange your books. The disabled toilet also includes baby changing facilities. The Park is licensed for 40 touring pitches (big pitch sizes), of which 37 have electrical hook-ups, and provides an ideal base for local attractions such as the Nevis Range, Glen Coe, the Jacobite Steam Train (as seen in the Harry Potter films), the Cave of Sculls (which is the deepest cave in Scotland) and Cuil Bay. For those of you who enjoy light exercise, there are many varied walks up and around the Glen, which are adjacent to the park. For the more adventurous, the area, which is known as the outdoor capital of the UK, has many outdoor pursuit activities which include Walking, Climbing, Sailing, Diving, Mountain Biking and Canoeing. We aim to provide the best in personal service and pride ourselves in the friendly atmosphere at the park. We look forward to meeting you and hope you enjoy your stay.